Throughout American history black people are the only group of people to have been forbidden by law to learn to read. This unique collection seeks to shed light on that injustice and subjugation, as well as the hard-won literary progress made, putting some of America’s most cherished voices in a conversation in one magnificent volume that presents reading as an act of resistance. Organized into three sections, the Peril, the Power, and Pleasure, and with an array of contributors both classic and contemporary, Black Ink presents the brilliant diversity of black thought in America while solidifying the importance of these writers within the greater context of the American literary tradition. At times haunting and other times profoundly humorous, this unprecedented anthology guides you through the remarkable experiences of some of America’s greatest writers and their lifelong pursuits of literacy and literature. The foreword was written by Nikki Giovanni. Contributors include: Frederick Douglass, Solomon Northup, Booker T. Washington, W.E.B. Du Bois, Zora Neale Hurston, Langston Hughes, James Baldwin, Malcolm X, Maya Angelou, Martin Luther King, Jr., Toni Morrison, Walter Dean Myers, Stokely Carmichael [Kwame Ture], Alice Walker, Jamaica Kincaid, Henry Louis Gates, Jr., Terry McMillan, Junot Diaz, Edwidge Danticat, Colson Whitehead, Marlon James, Roxane Gay, Ta-Nehisi Coates, Chimamanda Ngozi Adichie, and Colson Whitehead. Yolande Cornelia “Nikki” Giovanni grew up in Cincinnati, Ohio, and spent her summers with her grandparents in Knoxville, Tennessee, where she was born in 1943. Giovanni graduated with honors from her grandfather’s alma mater, Fisk University. A world-renowned poet, author, commentator, activist, and educator, Giovanni has published volumes of poetry, nonfiction, essays, and children’s books. She gained initial fame in the 1960s, as a leading voice of the Black Arts Movement, in the time of the civil rights and Black Power struggles. Awarded seven NAACP Image Awards, she has been nominated for a Grammy and was a finalist for the National Book Award. Since 1987, she has served on the faculty of Virginia Tech, where she is a university distinguished professor. Giovanni’s literary greatness is on par with the twenty-five legendary writers included in this anthology. In the following foreword, she has graciously shared her own experiences in the tradition of the narrative of the book. She also sets the stage for what precedes the era of these writers in America—the horrific journey of the Middle Passage. While few of us ever think of it, overcoming language differences among the captured enslaved and then subsequently learning American English were among the first miracles along the path toward Black authorship as we know it today—from the peril of education to the power of literacy and then the pleasure of literature. First a moan, then a song, now a book. Collectively, the pieces here serve as a testament to the will, the struggle, and the difference that learning to read, and then taking pen to paper, and now fingers to computer, has made in American history. It’s hard to believe that the relaxing, recreational endeavor of reading a good book that so many of us savor and take for granted was, for more than two hundred years, not only illegal for most African Americans enslaved in many states of the South, but also punishable by death. When it comes to voting rights, Black parents often admonish their grown children to be sure to exercise their freedom in every election, because people died in the fight to obtain the right to vote. The proof is not disputed. Black-and-white newsreels of African Americans being terrorized by state troopers, police dogs, and firehoses during protest marches against disenfranchisement in the 1960s have been continuously and dramatically included in documentaries and other films and news programs. They tell the story that riveted the nation’s consciousness and caused American presidents to act. The story of the struggle for full literacy among African Americans has yet to be documented as thoroughly. 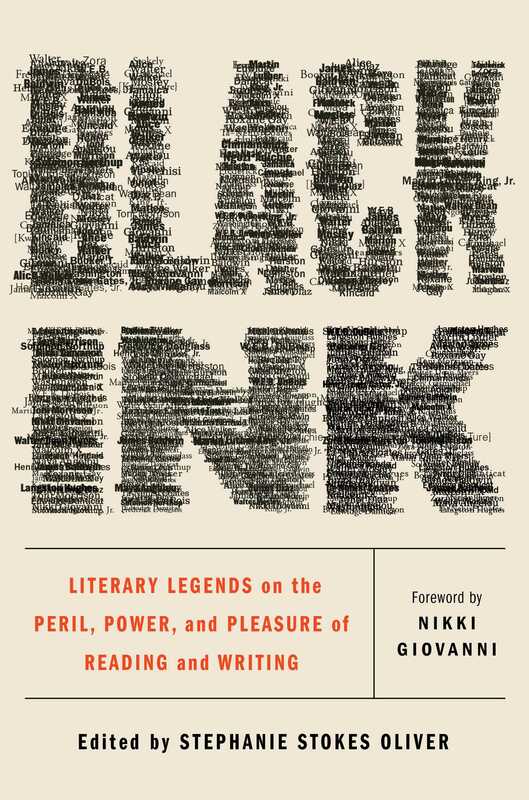 The purpose of Black Ink: Literary Legends on the Peril, Power, and Pleasure of Reading and Writing is to help fill that void. Much like the griot of African oral history—the revered storyteller of the tribal history, what we would call now the keeper of “institutional memory”—we honor this struggle for literacy by passing on the words and wisdom of the writers included here. We have collected twenty-five of the most elite, brilliant, and wise Black writers of the African diaspora, voices that tell the story of the plight to read, write, and publish throughout generations of our nations. Of course, there are many, many more Black writers, authors, essayists, journalists, and academics that could have been included to make a multivolume comprehensive work. However, we endeavored to provide a satisfying sampler of pieces that may motivate the reader to dig deeper and check out the original books from which these works were excerpted, as well as to explore additional Black authors and essays not included. Individually, the authors of Black Ink possess what Dr. Greg Carr, chair of the Afro-American Studies program at Howard University, calls the “deep critical literacy and content mastery necessary to meet intellectual curiosity, spur academic growth, satisfy the need to know, and to act to transform one’s self and the world.” Collectively, the pieces here serve as a testament to the will, the struggle, and the difference that learning to read and then taking pen to paper, and now fingers to computer, has made in American history. of trying to speak through it . . . Starting in the early 1800s, over approximately twenty-five decades up to today, the twenty-five writers of these expository essays of Black Ink explain to us the struggle and the joys of overcoming the challenges of reading and writing. They are: Frederick Douglass, Solomon Northup, Booker T. Washington, W. E. B. Du Bois, Zora Neale Hurston, Langston Hughes, James Baldwin, Malcolm X, Maya Angelou, Martin Luther King Jr., Toni Morrison, Walter Dean Myers, Stokely Carmichael [Kwame Ture], Alice Walker, Jamaica Kincaid, Henry Louis Gates Jr., Terry McMillan, Junot Díaz, Edwidge Danticat, Colson Whitehead, Marlon James, Roxane Gay, Ta-Nehisi Coates, Chimamanda Ngozi Adichie, and President Barack Obama, in an exclusive interview with New York Times book critic Michiko Kakutani. These pieces reflect the phenomenal African American progress from when it was illegal to learn to read—and Frederick Douglass resisted, escaped, and claimed his freedom—up to the election of our first Black President of the United States, an avid reader and mega-bestselling author. The voices are classic and contemporary, historic and avant-garde. Some reflect the unique perspective, sensibility, and wisdom of the immigrant. Many of the writers were born in the African and Caribbean diaspora and relocated to the United States, such as Stokely Carmichael (Trinidad), Jamaica Kincaid (Antigua), Junot Díaz (Dominican Republic), Edwidge Danticat (Haiti), Marlon James (?Jamaica), and Chimamanda Ngozi Adichie (Nigeria). Others were born in the States and eventually found a place that felt more like home elsewhere and died there, including W. E. B. Du Bois (Ghana) and James Baldwin (France). Stokely Carmichael, who grew up in New York City, made his transition in Guinea, in West Africa. Within the larger American literary tradition, Black voices are often marginalized or included as tokenism. Here, they are front and center, loud and clear, humble and proud, humorous and dead serious. Like ink itself, Black Ink is what gives us common ground whether in the ink made with tree bark by Solomon Northup (author of Twelve Years a Slave) to write a letter that would secure his freedom in 1853 or in the digital ink of our e-readers that now allow us to download novels, such as Colson Whitehead’s highly acclaimed The Underground Railroad, awarded the National Book Award (2016) and the Pulitzer Prize (2017), and chosen in 2016 by Oprah’s Book Club. Oprah Winfrey’s book discussion group, launched in 1996 during the successful twenty-five-year run of her internationally viewed television program, and her influence on the world of publishing, is another phenomenon of Black literary achievement. “In the black” is a positive financial term of success, to which we all aspire. As the editor of Essence and, later, editor in chief of Heart & Soul magazine, I had the special honor of assigning and editing feature pieces by great authors. My interest in reading literature was passionately developed while taking an African American lit course at Howard University. I graduated the year that Toni Morrison edited the groundbreaking historical collection The Black Book (an inspiration for this anthology). After college, working as a junior editor at one of the top women’s general interest magazines, Glamour, I was swept into an exciting time of emerging female voices in publishing: Nora Ephron was humoring us with her collection of essays, Crazy Salad; Toni Morrison was publishing her third novel, Song of Solomon; Alice Walker published an essay in Ms. magazine about rediscovering the work of Zora Neale Hurston. At Essence, I worked with a brilliant team of predominantly Black women editors who reveled in their duty to present to the African American reading public the best and brightest African American writers. Essence succeeded in providing a home for our literary writers who may not have been applauded at all or as often by the White-run literary magazines of the day. Many of the writers first published in Essence were then able to secure major book publishing deals. And those who were recognized by the publishing world relied on us to spread the word of their new releases. There was no greater delight conducting a photo shoot than at the Cincinnati home of Nikki Giovanni, and noticing her wall-to-wall bookshelves had been personally organized according to the Dewey decimal system. When Alice Walker became the first Black woman to win a Pulitzer Prize for Fiction, and also to grace the cover of Essence in dreadlocks—on a September fashion issue, no less—it was a great moment for the magazine. James Baldwin was still highly regarded in 1987, and showed his love for the magazine, writing an original piece for Essence at the time of his untimely passing that remains unpublished to this day. In 1992, when Terry McMillan drew crowds of Black women readers that formed lines around the block of bookstores at which she read from Waiting to Exhale, she made publishing history. The next year, when Toni Morrison became the first African American woman to win the Nobel Prize in Literature, it was a triumph for the world of letters and the literary aspirations and achievements of a people. I recall a lovely party thrown in her honor at the Gracie Mansion home of the first Black mayor of New York City, David Dinkins, Morrison’s Howard University classmate. Zora Neale Hurston wrote novels, but in her autobiography, Dust Tracks on a Road, excerpted here, she lamented that “Negroes were supposed to write about the Race Problem.” Novelist Chimamanda Ngozi Adichie warned almost seventy years later in a TED Talk speech that gained international attention, about the danger of the benign neglect of diversity and the feigned privilege of the literary lie of the “single story.” The strength of Black Ink is in the common knowledge among the writers of the power of inserting our diverse experiences into the “mainstream” and the courage to make change with words. That, I feel, is a most important part literature plays in our lives. In print books, we can study and cultivate greatness. We can learn about one another in the safety of our own homes and the privacy of our electronic devices, without concern over saying the wrong thing or being politically incorrect. With audiobooks, we can listen in on great storytelling, sans the current intrusion of the arguing and rancor of media talking heads. Reading gives us knowledge and wisdom that can bring us together to make change for the better in our lives, our communities, our countries, and our world. Reading matters. Writing matters. Enjoy. "A breathtaking anthology celebrating the power of the written word to forge change."